Contact us with your questions and input! 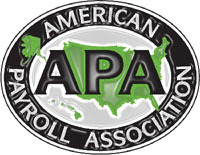 Welcome to The Wichita Chapter of the American Payroll Association! I am excited to offer you an opportunity to become acquainted with our Chapter. Once a month we offer Wichita-area payroll professionals the chance to get together for a delicious lunch buffet at The Petroleum Club, centrally located in dowtown Wichita. We feature a different speaker each month. Every speaker is a professional in his/her field and topics of discussion are preapproved by the National APA and can be used toward one hour of continuing education credit. Each meeting is from 11:30am to 1:00pm. The cost of each luncheon meeting is $16.00 for members and $20.00 for non-members. Payment is due at the meetings. For meeting schedules, please select the Meeting Information link, located in the menu section to the left. This is a wonderful way to network and develop friendships with others in the Payroll and Human Resources professions. I would like to encourage you to give us a try! Enjoy your visit!